Frank Maestas and Eliguis Montano were both arrested and charged with multiple felony charges. Frank Maestas, 37, and Eliguis Montano, 19, were arrested and charged with multiple felony charges after being caught by police selling stolen vehicles and stolen firearms. The Albuquerque Police Department Narcotic Unit discovered Frank Maestas and Eliguis Montano were stealing an average of 10-15 vehicles a week and were in turn selling them. On March 28th, undercover detectives were able to make arrangements to meet Maestas and Montano for a purchase of a 2015 Dodge Challenger and a 2013 Chevy Silverado both being reported as stolen vehicles. During the time detectives were talking with Maestas and Montano detectives discovered they were also selling stolen firearms. As detectives were taking the duo into custody, Montano decided he wanted to try to elude police and ran. A perimeter was set up and Maestas was eventually located and taken into custody. The stolen property was retrieved and was returned to its rightful owners. 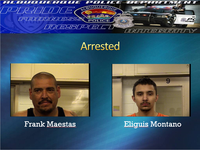 Both Maestas and Montano have a long criminal history for property crimes and vehicle thefts. Their criminal actions were possibly facilitating other crimes by arming others with stolen firearms who should not have them. This case will be sent to the District Attorneys officer for prosecution. Frank Maestas was arrested and charged with Conspiracy (4 counts), Receiving/Transferring a Stolen Motor Vehicle (4 counts), Receiving Stolen Firearms and Tampering with Evidence. Eliguis Montano was arrested and charged with Receiving/Transferring a Stolen Motor Vehicle (2 counts), Conspiracy (2 counts), and had active warrants for Unlawful Taking of a Motor Vehicle, Receiving/Transferring a Stolen Motor Vehicle, Possession of Burglary Tools, Tampering with Evidence, Resisting Arrest and Possession of a Controlled Substance. The outstanding work of the Albuquerque Police Department Narcotics and Vice Units not only reunited owners with their property but also prevented other crimes from being committed and saved lives.